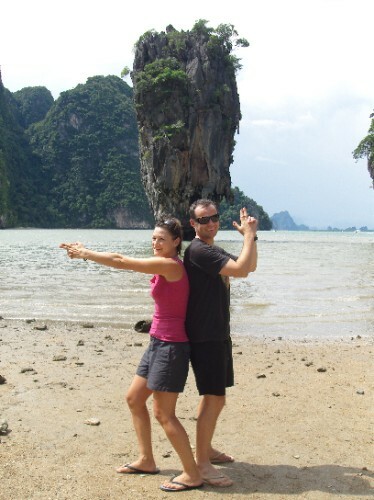 Blog from Phang Nga, Thailand | Where is the Love? The journey from Ton Sai to the town of Phang Nga involved a long tail boat ride, local bus followed by an air conditioned service bus from Krabi to Phang Nga itself.The journeys here in themselves are very entertaining.We had to wait about 40 minutes for the long boat to leave the beach as the driver would not leave without the minimum complement of 6 people (unless we paid more).From the back of the open air local bus we played the now usual game of spot the most number of people on one moped.The current record is 6.Mum, Dad, school aged child, small toddler, and a pair of baby twins, both asleep.5 is pretty standard and 3 or 4 now just average. Phang Nga itself was not up to much and unfortunately it rained incredibly hard for the whole of the rest of the afternoon.We found a place to eat and a seven eleven selling cheap beer chang.The reason for coming to Phang Nga was the day trip through the mangrove forest bay to the picturesque lime stone cliff and cave formations. Thankfully the next day was dry so we duly set off. The scenery was fantastic.Many cliffs jutting out of the water and we stopped to walk through a few caves into the hidden centre of some islands.After stopping of at a secluded beach for lunch we then visited James Bond Island (Scaramanga's island from The man with the Golden Gun) and a floating fishing village, which smelt great, before heading back to Phang Nga town.From here we thought we would go back down to Phuket for a little more beach action and duly caught the bus. The next day in Phuket however was torrential rain all day.We swiftly changed plans and booked the overnight bus to Bangkok that evening.What a treat that was.The first three hours on board this psychedelic double decker was spent listening to Thai pop tunes at top volume from a karaoke cd.After a stop at a strange service station for some of the garlicest sausages imaginable and a pirate version of Hancock, also in Thai, we finally got some sleep.